Auto Super Jack Herer is a very nice combination of classic strains that make a very nice new super auto hybrid! Auto Super Jack Herer is very similar to the standard feminized cannabis strain version we also offer. The only real differences are that you can save at least 2 weeks on your growing time and the height of the plants are reduced. The yields are slightly lower but you can make up for this by adding more plants into the same amount of space. With all automatic flowering cannabis strains you compromise a little with the strength as Ruderalis naturally lowers the potency. Otherwise this is a fantastic marijuana strain for the auto lovers and can be successfully harvested outdoors with multiple harvests annually. 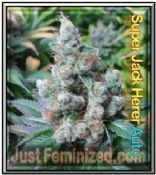 Super Jack Herer grows very well indoors with it being very well suited to beginners. Plants grow shorter than the non auto version finishing around 60-90cm tall with dense buds and wide spreading leaves similar to Sativa like stature. The smoke of Automatic Super Skunk Jack Herer is very nicely balanced with a good body stone as well as an energetic and imaginative mind set. This one is a little softer hitting than the non auto with it being a much better all day smoke that allows you to get on with daily tasks more easily. The buds are very tropical in flavour and give a really nice fruity fragrance. For Automatic Ganja Strain lovers this one is a good one to try for sure. Its highly resilient and gives a finished bud that is delightful to smoke.